Belvoir Christian Academy was established in Chattanooga, TN in 1887. For 130 years, the school has been serving children through 8th grade. In addition, we serve INFANTS, starting at age six weeks, through Pre-K2, Pre-K3* and Pre-K4*. Children may progress from Pre-K into our kindergarten, elementary and middle school programs. BCA's mission is to make disciples of Jesus through Learning, Loving and Serving, and we partner with families to teach, love, nurture and support children through each stage of their young lives. The Center is located on the BCA campus, with rooms dedicated to these age groups. We offer a year-round program for infants - Pre-K4, open weekdays, 6:30 a.m. - 6 p.m., closed only on major holidays. The program for infants through Pre-K2 is designed for families who need year-round care for all five days. Children who are in Pre-K3* and Pre-K4* may attend year-round or just for the academic school year, August through May. The Pre-K3 and Pre-K4 curriculum for the academic school year is a kindergarten-readiness program, and we are fully licensed and accredited through the Tennessee Department of Education. Academic hours during the school year (Aug. - May) are 8:15 a.m. to 12:15 p.m. Following the morning curriculum period ending at 12:15, children who continue on in the full-day program, will have lunch and return to their classroom for afternoon activities. Those in the half-day program will need to be picked up at 12:15. Please note that children who are enrolled to stay only until 12:15 p.m. will not receive lunch. Lunch is provided for those who stay beyond 12:15 and is included in the full-day pricing. Beginning in the infant room, babies are nurtured and read to and engaged in play with a variety of infant developmental toys and books. Feeding and nap schedules vary for each child at this age. Swaddling is allowed, but parents must provide a written request/release for our caregivers to do so. Once a child turns one-year-old (and must be walking well), they will move into the Pre-K1 classroom. As a group, children will take part in scheduled daily academic activities to prepare them for the next level of Pre-K2 and beyond. 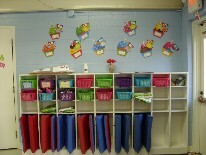 They will also eat lunch and nap as a group within their classroom. Teachers work with the children each day on letter recognition and sounds, numbers, colors, shapes, calendar, weather, and as a private Christian school, students will receive daily biblical teaching through age-appropriate lessons. Children in Pre-K3 and above attend the weekly chapel service on Wednesday mornings held in the sanctuary of the church next door to the school, Good Shepherd Lutheran Church. On occasion, chapel is held in the gym, especially on days with inclement weather. Children regularly work on arts and crafts projects to develop fine motor skills, and at this level, they also begin to understand socialization skills and are encouraged to use simple manners, share play items and and take turns in their daily activities. 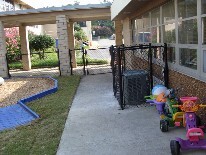 The Pre-K1 and Pre-K2 classes both have separate playground areas with age-appropriate equipment. 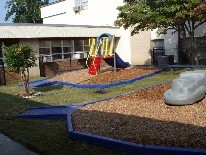 Pre-K3 and above have access to a large playground with multiple pieces of playground equipment to suit all ages. Children have the opportunity to play outside each day, weather-permitting, and have separate recess times from the older students. The school also has a full-size gymnasium to allow children ample room to play when weather does not allow for outside play time. We prohibit outside play when temperatures are above 95 or below 32 degrees. Nutritious lunches and two snacks daily, plus milk, juice and/or water, are provided in the weekly tuition. As babies are able to eat "table food", we will feed them items listed on the provided monthly menus and adapt as needed for this age group. Until then, parents will need to provide formula and infant meals/snacks. We have a fully-equipped kitchen and cafeteria where healthy meals are prepared. Infants - Pre-K2 eat lunch within their classrooms. Pre-K3/4 students go to the cafeteria to eat lunch as a group. Please let us know of any special dietary needs or food allergies to ensure your child's safety. Please note that we are not a "peanut-free" school, but we take extra precaution to protect children who have various food allergies to ensure that they are not exposed to foods/beverages that trigger allergic reactions. By Tennessee state law, children in Pre-K4 and under must be provided a nap/rest time of at least 1.5 hours. After lunch, children will lie down for nap with their designated nap mats or cots that we provide. Families must provide a fitted sheet, blanket and pillow or a type of nap mat that provides covering, etc. Families may request an application packet HERE or by contacting the Admissions Director, Emily Patton at 423.622.3755, ext. 12 or [email protected] We also encourage families to visit the facility by scheduling a day-time tour through Admissions during office hours (9 a.m. - 3 p.m.). Evening tours are available at our evening open houses, 4 - 7 p.m. on the designated dates. These are held during most months throughout the year. Check the home page of our website for these dates. *Children who turn three on or before Aug. 15 are eligible to enroll in Pre-K3. Children must be completely toilet-trained to enter PK3 as well.